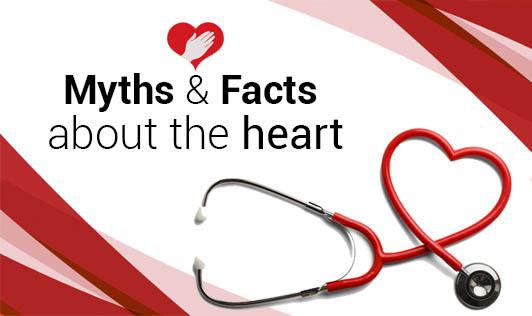 Myth: Heart failure means your heart has stopped beating.? Fact: Heart failure occurs when your heart muscle or valves have been damaged and your heart is not able to pump blood around your body as well as it should be. Myth: Cigarettes are hazardous to your heart only if you smoke.? Fact: Living or working with a smoker may also place your heart at risk. Passive smoking, or inhaling someone else's smoke, may potentially lead to heart disease. Myth: For a Type A personality, heart attack is inevitable.? Fact: Type A personality alone does not mean a higher incidence of heart disease. But some factors associated with a Type A personality like high blood pressure, smoking and lack of exercise can be other risk factors. Myth: Eating fish is the only way to get heart-healthy omega-3 fats.? Fact: Eating fish is just one of the ways to get omega 3 fats. Plant - based omega 3 fats can be obtained from walnuts, flaxseeds, soybean etc. For optimal heart health, include fish & plant based omega 3 sources in your diet. Did you know? Our heart pumps about 5 litres of blood each minute.